– Fragmenting mineral elements in water => all mineral elements in water are miniaturised = water restructuring. Lime, iron, manganese are fragmented and electrically discharged, and so are any other mineral elements present in the water. – Micro-peroxidation = water molecule implosion = energy release = oxygen in water. HOMEO DEKALC is the right solution wherever there is water and, in particular, in water-conducting networks, because it is ideal to prevent scaling, biofilms, sludge and other clogging agents. HOMEO DEKALC is of great benefit for hydroponic greenhouse crops in market gardening. Water is restructured by fragmenting, mineral elements stay suspended in water and lose their ability to stick to the sides of water mains, thus removing or preventing biofilm and deposits. Clogged water networks are now a thing of the past. The service life of networks and drip lines is extended. By acting on the biofilm, HOMEO DEKALC curbs bacterial growth and pathogenic micro-organism development. This restructured water is also a better WETTING agent, with higher DISSOLVING power, allowing for improved absorption of water minerals by plants. Fertilisers and other treatment substances dissolve more easily for easier absorption. Restructured water can be better retained by substrates, rock wool blocks, soil or other material. Micro-peroxidation is a physical and natural process leading to OXYGEN formation in the water, which fosters root stimulation, enhances plant oxygenation, improves cell hydration and goes on to boost plant vitality. By releasing oxygen into the water, micro-peroxidation also contributes to water balance and prevents bacterial, microbial and fungal growth. Fragmenting and micro-peroxidation in combination reduce fertiliser use by increasing oxygenation, enhancing mineral absorption and improving fertiliser dissolution in water. HOMEO DEKALC brings a clear hygiene benefit for constant network maintenance in greenhouses. HOMEO DEKALC also helps to restore the balance in storage ponds contaminated, in summer, by algae or heavily laden drainage water or any water generally, as it restores the water balance, and prevents bacterial, microbial and fungal growth. HOMEO DEKALC was initially intended for swimming pools to prevent the development of lime, bacteria and other pathogens. HOMEO DEKALC, once in place, requires neither maintenance nor consumables. HOMEO DEKALC is easily set up and needs no plumbing or fittings. 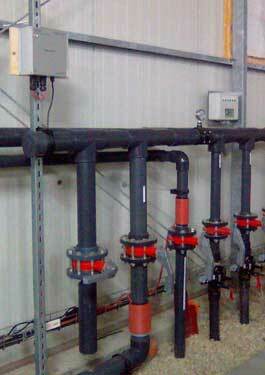 Pipes are sheathed with double-induction and connected to an electronic control box. (1) Photonics uses sunrays as a source of energy, enabling energy quanta and information transfer. Photons can cross matter. Photonics is already in use in communications, medicine and numerous new technologies. HOMEO DEKALC INNOVATES with its ease-of-use and high performance technology, that acts simultaneously on multiple water-related (structure/oxygen) and plant-related aspects, with several very positive knock-on effects on plant vitality, reduction in the use of fertilising and treatment products (the plant is healthier and highly dissolving water improves the efficiency of inputs), with neither consumables nor equipment maintenance required, and also by saving water through improved hydration and increased water retention in blocks or substrates. HOMEO DEKALC can also be installed in heating networks to remove sludge build-ups to optimise heating performance, resulting in significant savings, as 1 mm of scaling or sludge in one network equals to a 10% drop in heating efficiency. HOMEO DEKALC optimises any water-conducting facility and helps you save money.